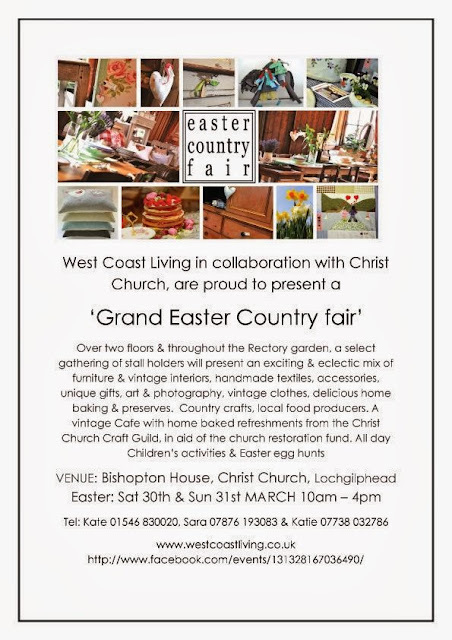 This post was originally published on my Write The Vision blog and considers a painting of mine, currently (June, July and August 2013) on exhibition in Argyll as part of Artmap Argyll's contribution to the Iona 2013 celebrations. The exhibition is named IN THE FOOTSTEPS OF COLUMBA. This explanation is intended to aid interpretation and guide the viewer into deeper meditation of our relationship with Christ. 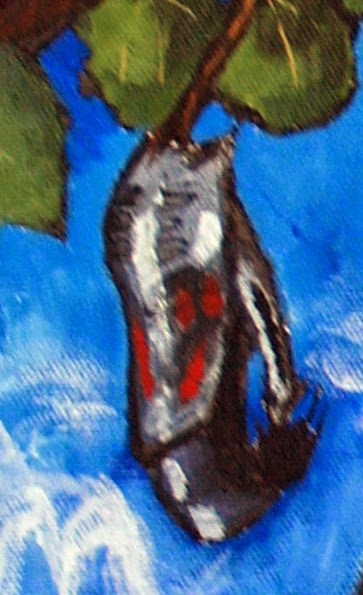 The painting exhibited is the middle segment of an illustrative triptych (as yet incomplete), taking as its inspiration the idea of Pilgrimage. Although often taken to be merely a journey to a shrine or holy place, the scriptural idea is one of 'walking with Jesus' - in reality, allowing the Holy Spirit to govern one's life so completely that the spirit of those faithful and that of God are inextricably joined. In the Bible, the word translated as 'pilgrimage' means 'dwelling place', and so the destination - the shrine, so to speak - is that of being 'made perfect in one' which John relates. The believer's walk with Jesus follows a pattern of maturing; growing up to the point where - in community with all those 'called of God' - they become 'His dwelling place'. This middle panel illustrates some of the spiritual significance of the second of the three Great Feasts of Israel - Pentecost. (The first is Passover, the third is Tabernacles - addressed in panels 1 and 3). Pentecost is representative of many matters of faith; the coming of The Holy Spirit to men, bringing clarity of understanding and wisdom; it means spiritual discernment; a coming in to The Holy Place from The Outer Court in the Tabernacle of God, and also the revelation of the truth as expressed in the person of Jesus Christ. Saint Columba stands as our representative in all three illustrations. He is not our intercessor with God, for only Jesus has that honour, he merely stands in our place as a saint of God and could fairly be substituted by any individual 'used of God'. The Bible is filled with images and allusions that reveal how this can be achieved, many of which informed the medieval and Renaissance painters in their work. Some of these metaphors are used here, and thus the concept of this part - and the triptych as a whole is based on patterns as used in Scripture and as used by artists of the past (particularly in the medieval and Renaissance periods). LAYOUT - The triptych reads from right to left and not in the 'western' convention of left to right. This is to highlight that our walk with Christ follows the sun from east to west (right to left to follow the usual reading) and illustrates Isaiah 55:6-11 showing that our ways run in the opposite direction to God's ways. One Dove. 1 signifies God, and the dove is a symbol for The Holy Spirit, an aspect of God. Genesis 1:2b And the Spirit of God moved upon the face of the waters. Two Figures. 2 is the number of witness, and those of faith must witness to and be a witness for Christ. Three Feet to reveal that the walk must be inspired by God. Psalm 37:23 The steps of a good man are ordered by the LORD: and he delighteth in his way. The feet are also unshod to show a clean-ness of walk. Five Scallop shells. Five is usually taken to reveal the grace of God. Six symbols behind and around the 2 central figures - six is the number representing man (created on the 6th day), and these 6 symbols show things which the natural world teaches us about the heavenly realms. Seven Basic colours used (excluding white) - blue, green, ochre, red, gold, brown and black - to indicate the perfecting work of God in Christ Jesus. Eight Colours. As above but including white, to signify the new life in The Holy Spirit. SKY - represents the 'Heavenly Realms', living in the Holy Spirit. VINE, VINE LEAF - represents Jesus, the true vine. 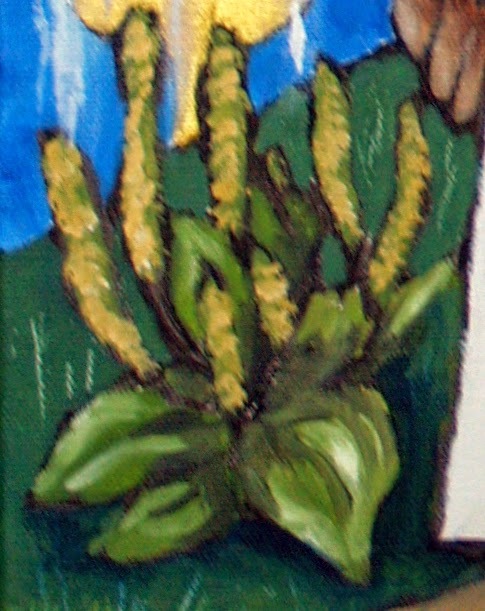 Vine used as symbol of the church of God. (See also John 15: 1, 5 & 8). 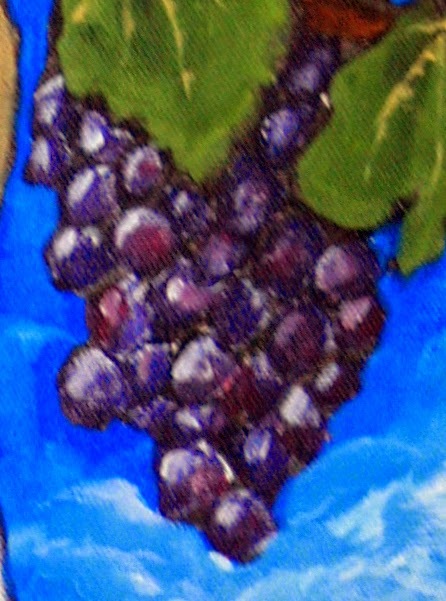 GRAPES - (fruit of the vine) the cluster; representing the fellowship of the mystery, or the community of believers. BUTTERFLY - Used as a symbol of life, death and resurrection. The Chrysalis stage (as here) is death, a metaphor for dying to our old life. 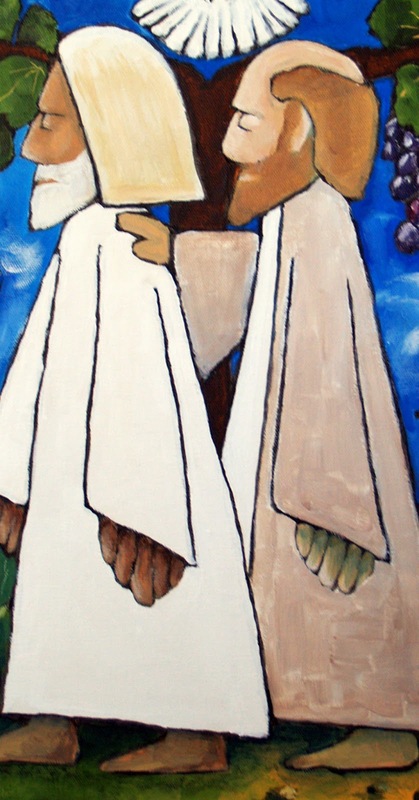 JESUS AND COLUMBA - both figures now walk from east to west, with Columba following in the way of Christ, who is robed in white to denote purity and holiness. Columba's garment on the other hand is only part white to denote that he has yet to reach perfection, but that the Lord is nonetheless working in him. CLOUDS - symbol of the unseen God and represents the veil. COLUMBINE - Latin for Dove (columba) and sometimes represented the gifts of the spirit (from Isaiah 11:2). St Columba (an colm chille) was known as "the Dove of the Church". PLANTAIN - common plant which thrives along roads and pathways. It became known as 'waybread', and a symbol of the 'well-trodden path' of the multitude that seek the path to Christ. FOUNTAIN - Song of Solomon 4:12 and Psalm 36:9. Also another symbol of the Holy Spirit; the fountain was perceived as a version of the 'single eye' (the nozzle through which the water erupted) and scripture tells us that we must have a 'single eye' (to be single-minded) in our relationship with God. Also "rivers of living water". GROUND - The right to left viewing shows the figures moving off dry, stoney ground (death) onto green grass (life), indicating a spiritual movement from the old life filled with difficulties, into a new life in Christ. He maketh me to lie down in green pastures. Psalm 23. COCKLESHELL, SCALLOP - signifies Pilgrimage. Scallop often represents St James the Great. Generally supposed to allude to the countless pilgrimages made to his shrine at Compostella in Spain. Artist Alexander Hamilton pointed out that the scallop became thus associated as it was readily found on this journey to Compostella and that the two halves could be used by pilgrims for the Breaking of Bread. The flatter part of the shell served as a small plate for the bread, while the deeper top shell could be used as a makeshift cup for the wine. In this way, the true meaning of pilgrimage becomes intertwined with the sacrament that Jesus gave to His followers to lead them into all truth. These are all only part of the 'reading of this painting. Each colour can be assigned a 'spiritual' meaning, and the relationship between this and the other two panels has a story to tell. The style of the painting alludes to the idea of a stained-glass window in a church, and the image has been kept deliberately straightforward and 'un-painterly'. Ultimately the intention is to reveal that we cannot know Jesus without the intervention of the Holy Spirit, who reveals the truth of God in all things and progresses our pilgrimage towards its fullness of expression in tabernacling with God.